The Castle – there are not too many countries in the World, that are still led by Nobles – Liechtenstein is one of them. The Prince of Liechtenstein lives in a medieval castles, that towers Vaduz. Unfortunately the Castle can not be visited – unless you visit Liechtenstein on August 15th, Liechtensteins national holiday – on that day the Prince invites the people of Liechtenstein to his Castle and in Vaduz there is a big party with an extraordinary display of fireworks. Hofkellerei Liechtenstein: You love good wines – then visit the Hofkellerei, where you can taste award wining wines. 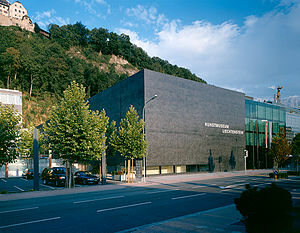 Kunstmuseum Liechtenstein: The royal family of Liechtenstein has an impressive art collection: parts of it are on display in Vienna (where the family resided until 1918) others are shown in this newly build museum, which is also an architectural master piece. Architectural fans should also have a look at the “Landtag” – the place where the Liechtenstein parliament resides … this is a very good example of modern wooden architecture. Galina Falcon Center: High up in the mountains of Liechtenstein, you can not only experience great hikes, there is also a falconry. There you can get in touch with Eagles and Hawks. There is also a Hawk and Eagle experience hike, which combines hiking and seeing this majestic animals in their natural surroundings. Liechtenstein Center: here you can discover Liechtenstein at a glance. Do not forget to get yourself a Souvenir Stamp from the Principiality of Liechtenstein. In Winter you can also enjoy Skiing in Malbun – a good skiing resorts for families with some truly great runs. Liechtenstein is a small country, and a rather expensive one … if you are traveling on a Budget I suggest, that you have your dinner and your hotel in nearby Feldkirch, just across the Austrian border, as you will get much more value for prize.